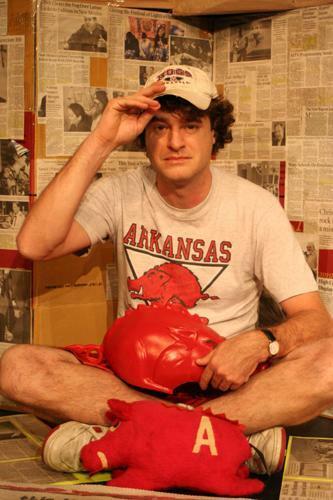 Comedian MATT BESSER is best known as one of the UCB4 (along with Amy Poehler, Ian Roberts and Matt Walsh) – stars of the Comedy Central sketch show Upright Citizens Brigade and founders of the famed NYC comedy theater of the same name. Next weekend, this “wickedly funny man” (The Onion’s A.V. Club) will be bringing his show Woo Pig Sooie to Connie’s Ric Rac, courtesy of the PHILLY IMPROV THEATER. Complete with head-to-toe U of A garb , the comedian brings his one-man comedic rant to Philadelphia for one night only on July 23rd. The next day, he will also be teaching a pair of workshops at the Adrienne… so for a benjamin, you can brush up with Besser yourself. Advanced tickets and workshop information can be via PHIT’s website.